Pavlova is something of a “leftovers” recipe. I never go out of my way to make pavlova or meringues. #sorrynotsorry I’m not going to apologize for it. We used 10 egg yolks for salted caramel ice cream and then had to use the leftover whites. The World’s Greatest Husband, Luis, was careful not to let ANY – and we mean ANY – yolk into the whites. The trick is to separate each egg individually. Should you get any yolk into the white, discard that white. It cannot be saved. I read that oils of any sort – even from your fingers – could prevent the whites from peaking. Ah, the more you know! As a basis for this recipe, I used my go-to meringue recipe from Everyday Food magazine. Messed with the proportions a bit, and voila! Serves Makes two 9-inch pavlovas. Mix egg whites and salt in electric mixer on medium speed until foamy. Mix in cocoa powder and fold in chocolate chips. 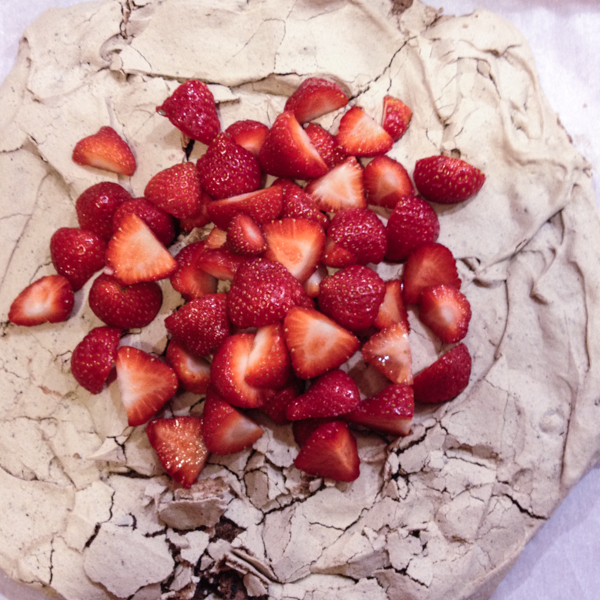 On a Silpat or parchment paper, drop dollops of meringue mixture and spread into a circular shape about 1 inch thick. Bake for 20-40 minutes at 300. Pavlova is pavlova when the exterior is nice and crisp and the inside is soft, but not raw. Tricky, eh? Remove from oven when outside is crisp; do not allow to brown. Do you like pavlova and meringue? If you had 10 egg whites, what would YOU do with them?